You’ve probably heard this before: the best offense is a good defense. And that certainly holds true for a lot of things in life, including your faith life. If you’re prepared and understand your faith yourself – you’ll be able to take the defensive stance where you protect and explain what you believe vs. the offensive stance where you’d be more accusatory and attacking. The better your defense, the better you’re off. If you’ve read the book this site is about, then you already have a good foundation for your defensive strategies. If not – and you’re interested in the book, just go to the tab at the top of the site and you’ll find where to get it , if you don’t want the book – that’s cool. It’s an interesting quote, to be sure, and I like it. Sets of images of quotes and explanations for them to further your understanding of Catholic beliefs and how to defend them, as well as deconstructing some protestant beliefs and showing the holes in them. They’ll be posted daily on the Facebook page – and weekly I’ll do a post here with the full set for that week. The first week’s topic is directly related to the above quote. It’s called, “Ubi Est Sola Scriptura?” meaning “Where is Scripture Alone?” Sola Scriptura, in case you can’t guess, means Scripture alone. The Bible alone is basis for all truth. No tradition. Nothing else. Everyone is free to interpret scripture as they wish. IF you don’t agree with someone, start your own church. Because then you will be the one that’s right. Yes? no. Now do you see how it relates to the quote from earlier? If not – it’ll become more clear throughout the week. Don’t worry. This set has 10 different quotes I’m going to post and explain over the next week, starting today. Share them on Facebook! They’ll be Pinterest too! He wrote that in the 5th century. Yet it rings true today, especially when you look at all the thousands of different Protestant Denominations of Christianity. They each use the same Bible (not the same one we use – that’s another thing we’ll discuss, don’t worry) but each interprets it in their own way. So you have 30,000+ different ideas for how the Bible should be interpreted. Do you see the problem with this? There’s only ONE correct way to interpret Scripture. 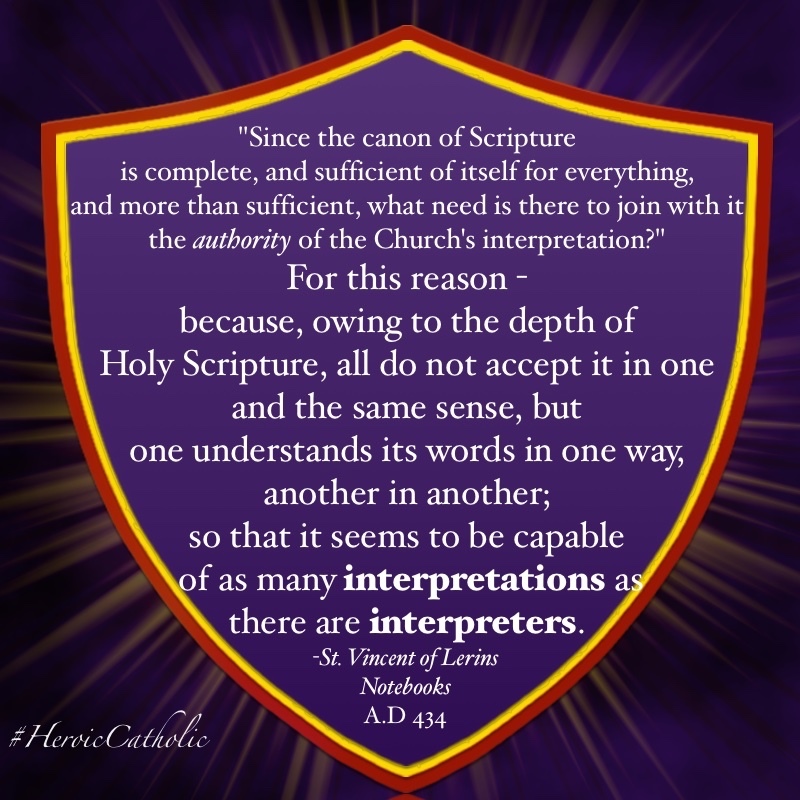 That’s what St. Vincent is telling us – the Catholic Church, through the Magesterium, helps us to know what is the Truth and understand the meaning behind each verse in the Bible. We (Catholics) all share one belief in how to understand it. Without the authority of the Church’s interpretation, we’d be lost. No one could know the right way. Think about it. It just doesn’t make sense. St Vincent is spot on, though. Don’t you think? I encourage you to share what you learn with others, even just by sharing this link on Facebook. It’d also help me out. You can also just sit back and enjoy your day – I don’t know about you but the weather down here is actually really nice right now. It’s not too hot, breezy, and comfortable for sitting outside. Today is a day I’ve been looking forward to and dreading for a while. Here are the days of scheduled classes, having to do schoolwork all week, due dates for homework are strict, having to answer to 5 teachers…and a wealth of newfound ways to reach out to people and a new, different form of freedom. Highschool was freedom in one way, college is freedom in another. With high school I was planning my future. With college, I’m still planning – but I’m experiencing the future I planned in high school. My studies paid off in the way that now I have the opportunity to study at a new level. Friends I had in high school have gone their separate ways, yet now I have the chance to make new friends and keep the old ones as well. I don’t know what God has planned for me at LSU yet. I’ll find that out day by day. Right now I”m focusing on one thing: making it to my next class on time! Good luck to all those starting college today! Enjoy! Pay attention in your classes, start discussions with peers, stay firm in your faith and keep God in your heart and you cannot fail. This week I’ll be launching a new way to help you keep your faith strong during the year! Be on the lookout on Facebook – and I”ll also be posting here every few days. That last quote is kinda tricky – what do you think it means? Tell me in the comments! Are you or is someone you know looking for a handy resource for defending Catholicism? Look up my book on amazon! Ebook is at a reduced price of $3.99 for a limited time!